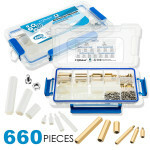 Each maker wants to have a complete set of copper pillars, screws and other fasteners at hand. No matter what the production, you can find the right accessories. CQRobot has a kit for you that includes copper posts, nylon posts, screws and nuts.Our engineers carefully selected the most commonly used models, the most commonly used in DIY projects.Let your wonderful work do not delay because of the small parts. Different components on the grid storage box, neat and clean, improve your work efficiency. We use them to install the circuit board and help build the robot. They are placed in different compartments of the adjustable compartment box (15 compartments).